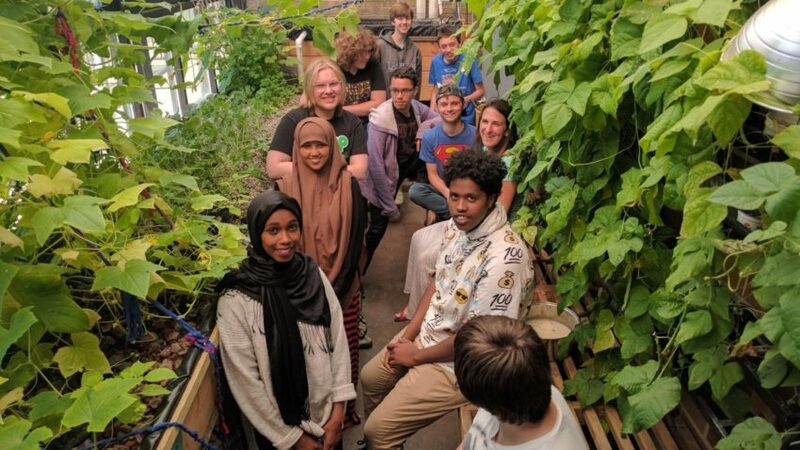 School Programming: Spark-Y partners with local schools throughout the Twin Cities to build hands-on sustainable food projects with students, including aquaponic systems, outdoor edible gardens, and vermicompost systems. The process of designing, building, and caring for these agricultural systems reinforces STEM-based (science, technology, engineering, and math) curriculum and develops youth leadership skills. Annual Summer Internships: Each summer, over 30 youth participate in a six-week sustainability “boot camp” as paid interns to gain real-world experiences through community partnerships where students execute projects throughout the Twin Cities. Teams are led by second-year internship graduates to create a culture of youth development and leadership. Urban Agriculture Lab: Spark-Y’s south Minneapolis headquarters is home to 1,300 square feet of aquaponic growing space dedicated to teaching youth how to grow and sell fresh food year-round. The aquaponic systems were designed, built, and receive continual maintenance by youth staff and interns. The Urban Ag Lab is a destination for school students to experience sustainable agriculture practices in an urban environment. Donations raised in May will be used to build an edible garden and aquaponic systems at Community School of Excellence (CSE), a Saint Paul Hmong culture and language school. Spark-Y and CSE also envision their partnership resulting in the implementation of schoolyard chickens, and the development of outdoor edible gardens, culinary labs, and a garden-to-cafeteria program that will allow students to grow, harvest, cook, and eat healthy produce while attending school.